I have not touched those since they were first introduced in around 1980 or 1981. There was a reason we called them "Meals Ready for Ethopians". Give me their predecessor the good old C-rat anytime. When I'm kayak camping and want to save on space and weight I take Moutain House dried food, and other dry foods and snacks plus a 10 pack of flour tortillas. I tend to avoid cannned foods and "wet" food beacuse of the added water weight. Instant coffee and oatmeal makes a quick breakfast. I use a metal cup so I can set it by the fire to keep coffee warm. I use a katadyn backpacker water filter to pump water from a "clean" source or just boil the heck out of it. If the water is just too nasty, I bring along a Stearns water sack. My picky kids like the Mountain House spaghetti with meat sauce. The Moutain House scrambled eggs with ham and peppers makes a nice breakfast taco. Midcoast Mark wrote: Sardines & saltines! Trust me, it is a whole lot better and nutritious than you think. And you have you choice of flavors: mustard, olive oil, catsup, louisiana hot sauce. No refrigeration required, good protien, omega 3s, carbs, salt. Not a sardine fan but you reminded me of a Lenten Friday lunch that is pretty good. Take a small can of tuna in water. Open drain then add some Miracle Whip and either chopped pickles or chopped nacho jalepenos. Eat on wheat crackers. Hmmmn, good! My vote is for the Hobo meals. I can eat them the whole time I'm out camping. I make mine at home and brown any raw meat then freeze them. You can limit the need for a cooler or limit the amount of ice needed by browning the meat and freezing the packages. I will mix and match so they aren't all the same. Use any meet you want to eat. it doesn't have to be ground meat and get crazy with the ingredients. My favorite is ground pork sausage, fresh squash, fresh green beans, peppers, onions, taters add some BBQ sauce and cream of onion or mushroom soup. Mix together, wrap it up, freeze it and when the fire is hot toss it in. -Tortillas and pita bread can help make some awesome light weight meals. -Pancakes are pretty easy if you have a pan. I usually ditch the pot for a light weight steel pan that can be used in the campfire. -Whatever you catch can be cooked over the fire. With a little practice campfire food will make everything else just plain. 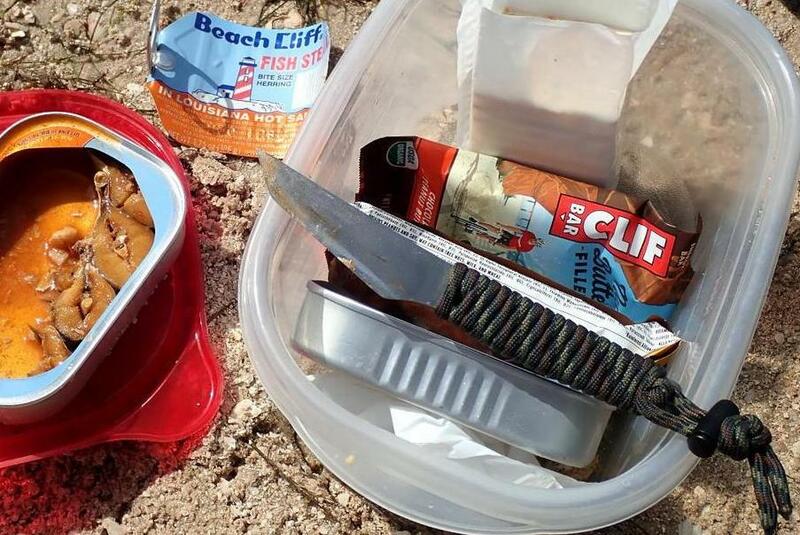 I always bring foil and some spices if I am doing anything outdoor related (not really when day fishing) just in case I decide to have a wild meal. Unfortunately the best meals are heavy unless you can acquire the meat while you're out there. Fried Chicken will last for days...just go get a bucket of popeye's chicken and put it in a couple gallon ziplock bags and keep it in the cooler. The best thing about the chicken is it tastes better everyday until its gone, and its even better cold. Course everyone knows about Stripes Famous Burritos....We buy em by the dozen when beach fishing. Great snack and they hold well. Spam is good as well. Smoked sausage does hold well in a cooler as well as summer sausage. Instant oatmeal packets. Just add a little hot water. It's tasty, comes in many flavors, and is good for your cholestoral. As a kid we used sardines. Beanie weenies and chips. Still sounds pretty good . Hunting we do stake on a stick [if we kill].If not we do kill some kind of meat rabbit,bird or some thing. We do take veggies. When fishing we do fish on a stick. We always catch some kind of fish.Some days we eat small but that is the cost of a bad day fishing.We have eaten so many difrant types of fish.Most all of it is good roasted over a fire. I take usually my 17hmr along with a 7mm Rem Mag. Rarely will I take food with me when camping. There are so many wild edibles that blow the food purchased off the shelf away...If you're lucky enough to catch some fish along the Texas coast while camping, then there is a bush with leaves that taste of Lime and Pepper...a few of those sprinkled over a fish on the half shell with some wild onions and garlic and you've got a gourmet meal fit for a king. You said easy, not taste good that's why I mentioned MRE's. If I get hungry enough, peanut butter and jelly taste like steak. I like to take leftovers from family supper from time to time and put them in vacuum seal bags and freeze them. I've always got a small cooler on the kayak (my go to is a small thick-walled styrofoam cooler that my wife had at work that they receive vaccines in), I'll toss them in. If I'm camping, I usually carry a small one burner propane stove. And bring a saucepan with a lid. Fill it with water, boil, drop bag inside, cut it open and eat. The only cleanup you have to do is lick your utensil clean, you can reuse the water once it cools for drinking, or cooking the next meal. And the only trash you have to pack is an empty plastic bag. Can do stew, chili, casseroles, really anything. Beef stew is my personal favorite. Same concept as what restaurants do using boiling bags for food. Better than viennie weenies and MREs. I will say it since no one else has. MRE's, not much on taste but very efficient. To me, tasted pretty good after fishing most of the day. The wife unit, will not allow them in the house due to having been in the Air Force and forced to consume them. Occasionally I'll do real cooking while car camping, and then on the other end when doing certain ultralight backpacking I do no more cooking than heating up water on an Esbit stove, but most of my camping food falls in between these two extremes, where I want a hot meal but not a lot of cleanup or having to worry about getting raw foods cooked all the way through on a pack stove or over a fire. That means heating up preprepared stuff. I cook chili, soups, stews, and even meat at home and vacuum seal them in the Foodsaver. I can make them weeks ahead and throw them in the freezer, and just put them in the ice chest when it's time to go, pull them out, cut open the bag and heat them up in a pot or pan when I'm ready to eat. I smoke a lot of meats and fishes at home that then get put into foodsaver bags and frozen. Smoked pork chops are a favorite, good for breakfast or dinner, and smoked redfish makes a nice appetizer on some bagel chips with a little sour cream (in the squeeze bottle) and premade pico de gallo. Quesadillas are easy to make in camp, just have a nonstick pan, some tortillas (I like the parcooked Guerrero ones that you puff up in a dry pan), some shredded cheese, some precooked meat per above, and salsa - there is a really good brand of salsa you can get at HEB that comes in a pouch. If you want to do a "fancier" breakfast, the precooked, shelf-stable bacon that has been out for a while now is really handy, as is Bisquick's jug of pancake mix that you just fill the jug the rest of the way with water and shake, then pour onto a hot pan. nmYAK4fish wrote: Fried Chicken will last for days...just go get a bucket of popeye's chicken and put it in a couple gallon ziplock bags and keep it in the cooler. The best thing about the chicken is it tastes better everyday until its gone, and its even better cold. You are correct, I love cold chicken, particularly the legs. Legs are easier to eat while fishing. Makes a great slick! phoenixphishing wrote: Vienna sausages! Yeah they're not great, but they're a tradition in my family for all fishing trips. We normally do alright, so they may bring good luck too. Get some packets of Taco Bell hot sauce and take them along. For me it makes a Vienna sausage a lot easier to eat. the traditional fishing lunch is Beach Cliff fish steaks in LA Hot Sauce eaten on crackers and handled with your knife. Complimented with a Ballast Point Sculpin IPA, sold in cans. If you have anything for a burner, Kielbasa is a perfect camp store. You can grill it (and heat a can of Ranch Style beans), you can split it and fry it, and goes nicely with scrambled eggs.